When we are short of space, one thing that baffles our perspective is that whether interior designing can help our space to look better. Well, the answer is definitely a yes. 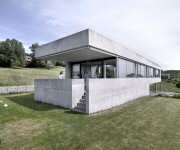 Architects like Felber Szelpal have made the dreams come true for homeowners in Switzerland. The house has been constructed in a way that every inch of the space can be used wisely and the backdrop makes this house really comfortable to dwell in. 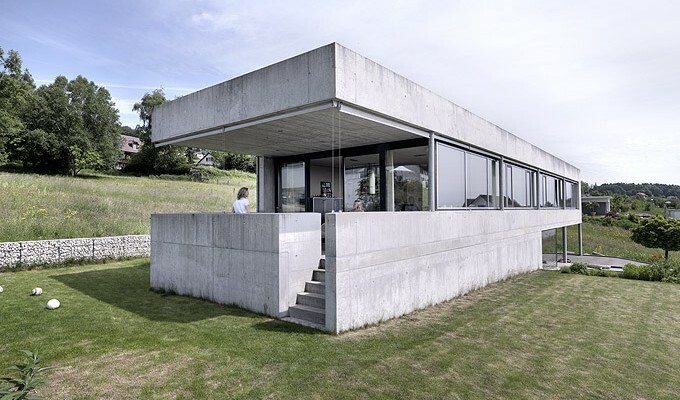 House Szelpal in Solothurn, Switzerland was constructed in 2006 by Felber Szelpal Architekten. This is a wonderful architecture sited on a spectacular landscape that adds to the beauty of the residential plan. An elongated cube like house encompasses two floors and the interior keep up a correspondence with the outside space on opposite ends of the structure depending on floor. The garden is made accessible through the west from the terrace above, while entrance is on the east front. As you climb the upper floor, a panoramic view on the entire alpine catches the attention and this is one aspect, which has been wisely used by the designer. The owners wanted to incorporate more of functional spaces in the ground floor and so, they planned to incorporate an office, cellar and utility rooms on the ground floor. The main rooms for living are on the first floor and are beautifully oriented towards the view. 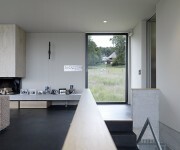 The use of glass in the living space gives a view of the entire landscape and keeps the space brightened. The open kitchen plan with a dining space adjacent to the kitchen counter makes the complete room easily accessible and offer more flexibility to the homeowners while entertaining the guests. The spacious bathroom reveals calm beauty where one can relax after a hectic day and can enjoy soaking up the body in water. The use of glass wall inside the bathroom gives an expression of maximized space. The monolithic concrete body enhances the overall look of this structural design even more. The clear and hard outer shell of the house reveals an elegant attitude, while the cozy interiors make the space very comfortable to live in. 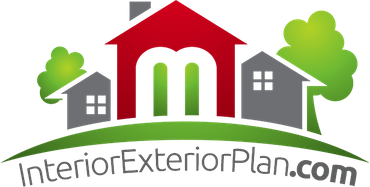 The internal insulation is an added feature that adapts to the changing needs of the family in a simple manner. The architect Felber Szelpal has managed to maintain a balance between various aspects of the house. The best part is that the design proposed by the architect neatly meets the needs of homeowner along with keeping intact with their budget. The comfortable feel in the interiors make the space wonderful to relax and calm down the body after chaotic schedules. When entertainment is the main agenda in your living room!